James Lind Institute (JLI) is a global education Institute based in India with a registered entity in Singapore and information centers in Kenya, Nigeria, Canada, U.S and the Middle East. James Lind Institute is a full member of the prestigious International Council for Open and Distance Education (ICDE), Norway; International Federation of Training & Development Organisations (IFTDO), Switzerland; and is accredited by the American Board of Accreditation Services (ABAS) as per ISO 9001:2008 standards for providing Training & Education Programs in areas such as clinical research, medical writing, pharmacovigilance, healthcare etc. With students from more than 80 countries enrolled across multiple training programs, JLI is one of the worlds largest clinical research and healthcare training provider. Over the years JLI has developed unique specialized programs that enable students to face the challenges of the demanding pharmaceutical and healthcare industry and to grow further in their career. To provide superior education to our students through comprehensive and integrated academic courses enhanced by technology, concerted interdisciplinary approach with global reach, embracing research, scholarly pursuits, and relevant industry participation. Our vision is that JLI will be the resource of choice for higher skills education and revolutionary learning. JLI will be an essential contributor to quality education that meets the demands of the growing industry. We envision JLI as a place in the academia where talent and Industry come closer for mutual constructive efforts. Career oriented learning is at the center of all we extend ourselves to achieve. We incessantly improve the learning experience and its relevance to those we serve through innovation, nimbleness and developing a path of career security. Our learning approaches are governed by the highest degree of ethics, integrity and social responsibility, exhibited through transparency, openness, trust and dependability. We at JLI have a never ending approach to exceed expectations for quality and service in all that we do. Shaping the career of our students is at the center of all we do. For achieving this, all potential means are explored ranging from mentoring to presentation and referencing before the relevant industry. We value all our students and invest in their personal and professional growth and development, and assist them in their career path from basic needs towards self actualization. We plan prudently for our students by monitoring the key changes in the industry and take appropriate actions that prepares them ahead of time to meet future challenges. At JLI our focus is to build careers by offering programs that are relevant to the existing job market and in high demand. We offer a unique opportunity for you to pursue your goals, grow and build a professional background that employers would highly value. Whether you are an experienced professional in the domains in which we offer programs or just getting ready to start a professional career, James Lind Institute offers you many advantages that help you to stay ahead of your peers and have an awesome career. Accredited and internationally accepted courses, user friendly e-campus, 24 x 7 availability of your course materials, career guidance from personal mentors, placement support, personalized profile pages, access to job portal etc. are a few of the many advantages that JLI has to offer you. 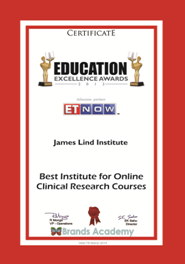 James Lind Institute has been awarded the Best Institute for Online Clinical Research Courses in the Education Excellence Awards; and the Best Institute for Pharmacovigilance & Medical Writing Training in Prime Time Education Excellence Awards, 2017. James Lind Institute is also part of many global initiatives. An example is our affiliate membership of the James Lind Alliance based in UK, our being a signatory to the AllTials Campaign. The James Lind Alliance was established in 2004 to bring patients, carers and clinicians together to identify and prioritise the Top 10 uncertainties about the effects of treatments that they agree are most important. With the AllTials Campaign James Lind Institute is supporting the cause of bringing transparency in the reporting of clinical trial results.